It's been awhile since I've treated you all to a tutorial. I think it's about time that I do that once again! Monday was my first Stamp-In Workshop in my new home. I haven't been able to host a workshop since October what with all the purging, packing, moving, unpacking, settling, etc. I promised the girls that I would hold one in January, and I DID! 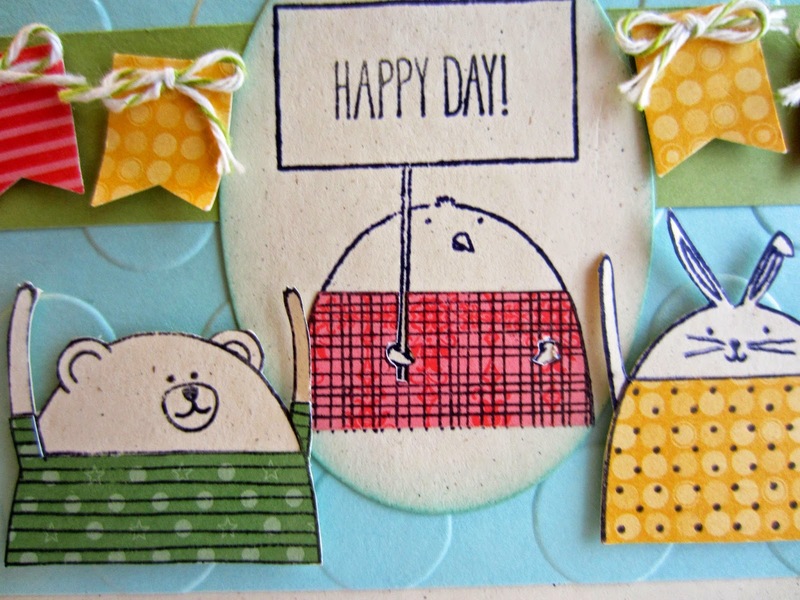 Cheerful Critters, a new set in the new Occasions Catalog (page 14), immediately struck me as completely PRECIOUS! Their deadpan expressions and their excited upraised skinny arms (the bunny and the bear anyway) endeared them to me. Since I am a demonstrator, I am lucky enough to be able to preorder items from an as yet unreleased catalog. So, I was able to get the set and have a sample ready for my girls to make right around the time that the catalog went live. Fold a sheet of 5 1/2" x 8 1/2" piece of Naturals Ivory cardstock in half, creasing well with a bone folder. Run a 4" x 5 1/4" piece of Pool Party cardstock through the Big Shot inside the Large Polka Dot Embossing Folder. Adhere this piece to the card front. 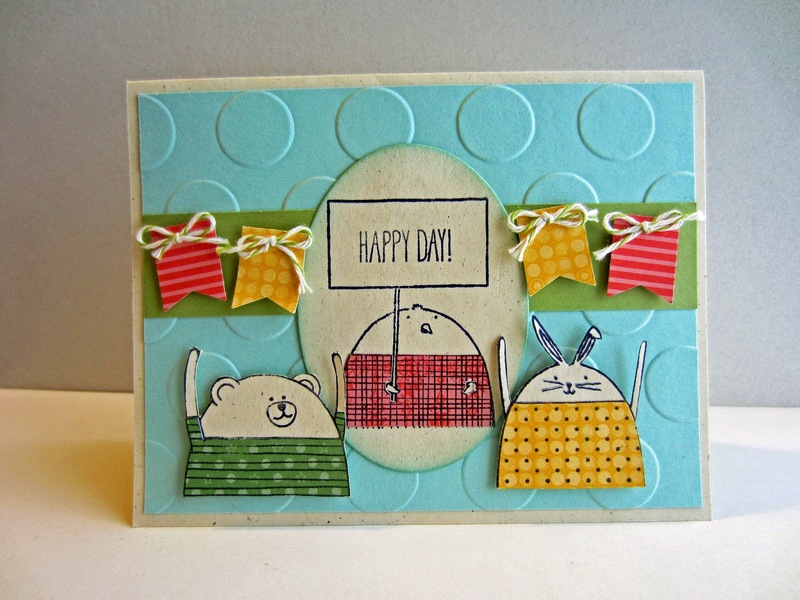 Add a 1" x 5 1/4" strip of Pear Pizzazz cardstock about 1 - 1 1/2" from the top of the dotted piece. On a scrap of Naturals Ivory cardstock, stamp the chick, including his sign. Cut him out with the appropriate Oval Framelit in the Big Shot. Sponge the edges of the oval with Pool Party ink. Adhere the oval over the green strip. On Naturals Ivory cardstock scrap, stamp the other two critters. Carefully cut them out. If you truly HATE the cutting, you can eliminate their arms. But I think their little upraised cheering arms look so cute! Up to you. From among your scraps of DSP, choose three that will be the shirts for your critters. Stamp the shirt portions in black. Cut out the shirts. On the bear, if you eliminated the arms, you can skip the arms of his shirt. Glue the shirts over the ivory-colored ones, including the one in the oval. Add a couple Stampin' Dimensionals to the backs of these two critters and, overlapping the oval slightly, adhere them to the card front. From the leftovers of your shirts, use the Banner Punch to punch out some banners. Cut a piece of the Baker's Twine. Tie it into a bow, and glue the bows to the banners. Once they have dried enough, attach the banners happily to the green strip with a Stampin' Dimensional on each one. Before I close, I need to tell you about something WONderful that is going on at Stampin' Up! right now: their annual SALE-A-BRATION! This year, the event runs until March 31! During this time, for every $50 you spend (before shipping and tax), you can choose one FREE item from the special Sale-A-Bration brochure! Woo hoo! Free selections run the gamut from exclusive limited time stamp sets, accessory packs, Designer Series Paper packs, Project Life goodies, Specialty Designer Series Paper, AND packs of Blendabilities Markers! If you would like a copy of the Sale-A-Bration brochure, let me know, and I will get one mailed out to you! C'mon join the limited-time fun of earning wondrous FREE STUFF! How adorable! Thanks for linking up with us on the Oh My Heartsie Girls Wordless Wednesday. That is so cute. Wish I could have been there. What a cute little card, simple and yet so adorable.